There are various options for accommodations in the holy towns of Mathura and Vrindavan, in Uttar Pradesh. Hotels in Mathura are more plentiful than hotels in Vrindavan, although quality is often lacking and congested Mathura is not as appealing. In Vrindavan, the old part of town is particularly atmospheric. This is where you'll find inexpensive guesthouses and ashram accommodations. The downside is that they tend to be very basic. 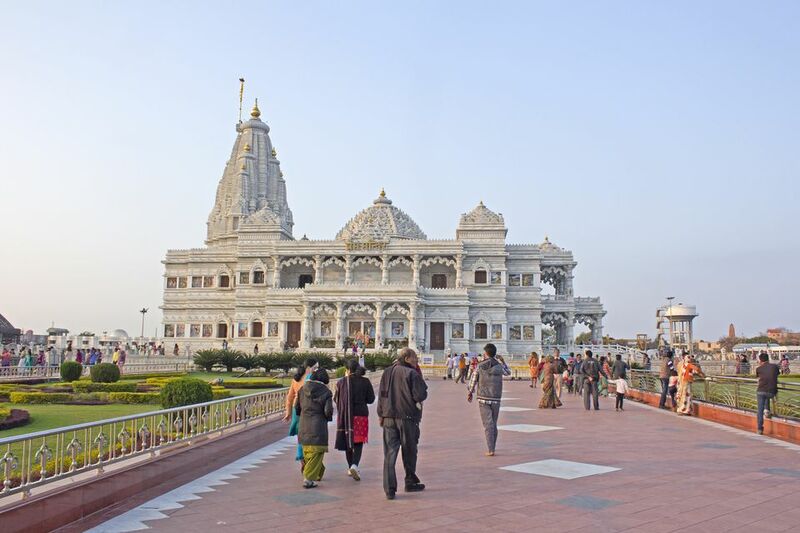 Popular ISKCON Temple is situated on the outskirts of town and the accommodations near it are more modern (and costly), although the temple does have a guesthouse. If you want to experience the ancient spiritual side of Vrindavan, it's better to stay nearer to Banke Bihari Temple, which is closer to the old town. The festivals of Holi and Krishna Janmasthami attract huge crowds, so be sure to make reservations well in advance for these occasions. The Nidhivan Sarovar Portico is a relatively new hotel -- it opened in May 2013 -- that's located on the outskirts of Vrindavan near ISKCON Temple and Prem Mandir. As you'd expect, the interiors are fresh and attractive, and facilities are a notch above what other hotels offer. Guests particularly love the food. If you want to stay in the best hotel in Vrindavan, this is it! There are 58 rooms. Expect to pay about 6,000 rupees for a room upwards. The contemporary Kridha Residency is situated on Bhaktivedanta Swami Marg, the main road, near Prem Mandir and the ISKCON Temple. It opened in 2011 and gets its name from the union of Krishna and Radha. Although it is a modern hotel, it aims to convey a spiritual feel. There are 50 exceptionally spacious rooms (including three and four bedrooms suites, and a four bedroom villa -- fantastic for families!) with private balconies. Facilities include a vegetarian South Indian restaurant and in-house car service. Guests really appreciate the hotel's outstanding hospitality. Rates start from around 3,500 rupees per night. The Mayapur Vrindavana Trust Bhaktivedanta Ashram guesthouse provides a tranquil and secure place to stay amid scenic landscaped grounds right next to the ISKCON Temple. Established in 1972, the hotel's neat and simply furnished rooms, with air-conditioning and wireless Internet, are a step up from the usual bare ashram accommodations and attract a lot of foreigners. There's a healthy organic vegetarian restaurant on the premises. Expect to pay about 2,300 rupees per night for a room upwards. The Brijwasi Royal, one of the most popular hotels in the heart of Mathura, is a reliable choice. It's strategically located not far from the railway station. The hotel's restaurant serves tasty and inexpensive food, and the service desk is very efficient in making travel arrangement for guests. Room rates start from around 3,000 rupees for a double, per night, including breakfast. Family rooms are also available. If you'd prefer to stay a short distance out of town, try the spacious Brijwasi Lands Inn situated just off the Delhi-Agra road. Also by the renowned locally-based Brijwasi Group, the Centrum Hotel is a cheaper alternative near the railway station and bus stand in Mathura. It's a brand new hotel that opened in 2017 and has 30 generously-sized guest rooms. It's well-maintained, secure and cozy with a great range of facilities including free wireless Internet. There's also a restaurant and sweet shop on the premises. Rates start from about 1,700 rupees per night for an air-conditioned double. Hotel Krishnam is a modern hotel that opened a few years ago in a super convenient location on the main road midway between the ISKCON Temple and Banke Bihari Temple. It's possible to walk to either temple in around 10 minutes from the hotel. There are 40 spacious rooms, a multi-cuisine restaurant, and travel desk. Rates start from about 2,600 rupees per night. Breakfast is included. Vrinda Palace Seva Dham is an noteworthy new budget hotel in a quiet, developing interior location away from the main road but still less than a kilometer from the ISKCON Temple. There are 40 clean and comfortable rooms with basic amenities, including air-conditioning. Service is excellent and the hotel is great value for money! Rates start from 2,500 rupees per night. The Shubham Group has quality budget properties in Vrindavan near Banke Bihari Temple. The group's first property, the Hotel The Shubham, has 24 rooms priced at around 1,400 rupees per night for a double with air conditioning. The newer Hotel Shubham Holidays has 40 rooms (including triple and family rooms) with rates starting from around 1,400 rupees per night for a double with air conditioning. The Shubham Holidays is particularly good value for money. A third, larger, property called the Shubham Majesty opened in 2011. It has 60 rooms with rates from 2,100 rupees per night. Ananda Krishna Van is a large hotel with 120 rooms and a delightful, sprawling garden setting in the area behind ISKCON temple (about a 10 minute walk away). It caters mostly to families on pilgrimages. Kids will love the open space and swings! The hotel also has a vegetarian restaurant. Expect to pay around 2,000 rupees per night for a double room. If you're looking to experience the ashram lifestyle in the old city, Vrinda Kunja is one of the best (and cleanest) places to stay. Its leafy, sacred grounds are home to the world center of the Vrinda Mission and its Vrindavan Institute for Vaisnava Culture and Studies. The ashram is one of Vrinda's Yoga Eco Villages and many of the residents are Spanish speaking Krishna devotees. Visitors can participate in chanting, yoga, meditation, discourse with the Swami, and volunteer work. Numerous activities can also be arranged advance, including walking meditations through the town's alleyways, yoga workshops, Ayurveda, Vastu principles, and astrology. Two different kinds of rooms are offered -- basic for spiritual seekers, and "luxury" for other guests. You may have to share a room or a bathroom. Expect to pay around 1,000 rupees per night upwards, with meals included. Munger Mandir Guest House is another decent option for an authentic ashram stay in Vrindavan. It's located on the Mathrua-Vrindavan Road, near the Rama Krishan Mission. Musicians perform live Krisha devotional songs in the main ashram building throughout the day, creating a special atmosphere. There's a wide range of accommodations. Rates range from 250 rupees to 1,000 rupees per night, depending on facilities. The more costly rooms have hot water and air conditioning, while the cheapest ones have squat toilets. Meals are included in the price.